Approaching or moving into retirement means being prepared for this next phase of life. Find out what to consider and how our Retirement Section can help. A lot of people think of retirement as a finishing line. There’s excitement when you get there and perhaps a sense of accomplishment. what lifestyle you want before you retire – ask yourself what do I love doing, what inspires me, what am I good at and what knowledge have I accumulated that I wish to use? how you will replace the things that you get from work such as routine, status, social networks and ongoing learning opportunities – create a list of the experiences you’d like to have, places you’d like to visit, skills to acquire, hobbies to pursue, part-time work or volunteering opportunities and relationships to build. experimenting before you retire – rather than retiring completely, reducing your work hours can give you time to experiment with other pursuits before you retire for good. This is what’s known as easing into retirement. figuring out how much you’ll need – there’s no definitive answer to how much you’ll need in retirement but a good indicator is the Retirement Standard produced by ASFA (Association of Superannuation Funds of Australia). estimating if you have enough – you can use our Model My Super calculator by signing into your account calculator to estimate your account balance and potential annual income in retirement. If there’s a shortfall compared with how much you think you’ll need, there are many ways to give your super a boost. seeking advice – an ANZ Staff Super financial adviser can advise you on how you can make the most of your super and help it last the distance when you get there. Call on 1800 000 086. Having done all that and worked out that you’re ready to retire, or want to ease your way there, you might be concerned about how you’ll go with a lower, or no, regular income. That’s where our Retirement Section can help. Transition to retirement lets you reduce your work hours while maintaining your income. To be eligible, you must still be working and at least age 57. Retirement income – lets you convert your super into a regular income in retirement. You continue to benefit from our low fees and the same investment choices while drawing a regular income in a tax-friendly environment. You can find out more about both Retirement Section options by reading the Retirement Section Product Disclosure Statement on the Documents page. If you want to move to part-time work but don’t want to reduce your take-home pay, our Transition to retirement account lets you access your super to supplement your income while you ease into retirement. This is often called ‘transition to retirement’. You choose how much you want to receive in income payments each year within minimum and maximum payment limits set by the Government. under age 65 and have reached your preservation age (see table below). an ANZ Staff Super member. For more information about our Transition to retirement options, read the Retirement Section Product Disclosure Statement. A Retirement section option provides a regular income for you in retirement while your super savings stay invested in a tax-friendly environment. You open a Retirement section option by transferring a lump sum from your ANZ Staff Super account. You defer any lump sum tax on your super and receive regular income payments from your Retirement section option. This is illustrated below. Read the Retirement Section Product Disclosure Statement (PDS). Remember to attach your proof of identity and a completed Tax File Number declaration (available at ato.gov.au) if you are below age 60. Before making a decision to open a Retirement Section option you should seek financial advice from a licensed financial planner. You can contact an ANZ Staff Super financial adviser on 1800 000 086 who can give limited financial advice over the phone. Get the advice you need before you retire or transition to retirement. You can contact an ANZ Staff Super financial adviser on 1800 000 086 who can give you limited advice on the Retirement Section options available, how much to invest and your investment strategy. 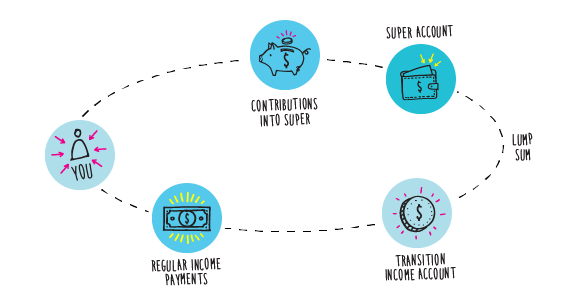 Whether your needs are simple or complex, an ANZ Staff Super financial adviser can help. ANZ Staff Super has an agreement with ANZ under which ANZ’s financial advisers have been engaged to provide members with general or limited personal financial advice about options within ANZ Staff Super over the phone for no extra charge. If you require more complex personal advice, you’re given the option of receiving comprehensive personal advice from an ANZ financial adviser and ANZ will charge you a fee for this advice. You have the option to have the fees for ANZ Staff Super-related super advice debited from your account. This facility applies only for fee for service advice provided by an ANZ financial adviser and no commissions will be paid under this facility. To find out more, read the Financial Planning fact sheet. Financial planning services are provided by ANZ’s financial advisers under ANZ’s Australian Financial Services Licence number AFSL 234527. Any advice provided by ANZ’s financial advisers is not provided or endorsed by the Trustee and is not provided under The Trustee’s AFSL.